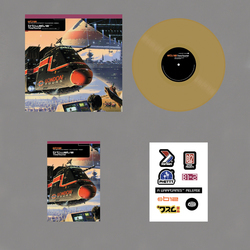 B12 - Time Tourist (Expanded Edition) + Bonus Level 12” Bundle. Bleep. Upon its original release, Time Tourist looked further out than most of B12’s AI peers to the outer space narratives that played such important role within the origins of techno that were built within the late 80's and early 90's landscape of Detroit. As such, they reached levels of science fiction escapism few others have rarely surpassed. Having dug through their archive, B12 also offer us a glimpse of a new route through the alternative reality once travelled by the Time Tourist. The epic skyline of 'Scriptures' and 'Infinite Lines' get transported to new planets with these fascinating FX-laden dub versions, while the Likemind mix of 'Silicon Garden' steps further down the path towards Jazzy liquid techno. Before the soundtrack elements of 'DB5' are pulled to the surface with all the underground insanity of an Andrzej Korzynski soundtrack.